Connect with Nature...in Your Own Space! Do you have an innate desire to bring the beauty and wonder of Nature into your surroundings? Whether you regularly appreciate Nature or sometimes experience Nature Deficit Disorder, you may find what you are seeking here! We help you connect with the peace and wonder of Nature by creating distinctive photographs and videos while immersed in the wilderness experience. As free-range photographers, we compose videos and photographs that are natural and organic, with no additives or artificial colors. We have a rich portfolio to suit your tastes and needs, and nourish your soul. Explore our inspirations from nature to find what speaks to you. 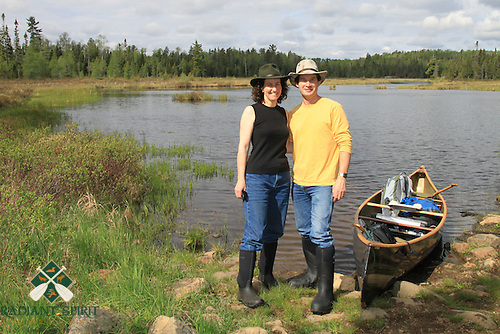 We are Gary Fiedler and Dawn LaPointe, a husband and wife photography team based in northern Minnesota. We are passionate about preserving nature's artistry through photography, its wonders through video, and our experiences through writings. We explore many nearby wilderness areas: the Boundary Waters Canoe Area Wilderness, Quetico Provincial Park in Canada, the Superior Hiking Trail, Lake Superior region, and magnificent public parks. Our commitment to capturing unique images of the areas where we live and play, provides rich opportunities for nature lovers and art enthusiasts to enhance their surroundings with the energy and beauty of nature. We each offer decades of exploration and experience with photography in the great outdoors. During childhood, Dawn received her first camera as a gift from her parents -- a red Polaroid-type instant camera, followed by a few other film cameras over the years. As a kid, Gary may have made the first camera drone by fastening a Kodak disc camera to his radio-controlled airplane! He has always been a resourceful and innovative Do-It-Yourself-er! Born and raised near the Mississippi River (in different states), we were both drawn to the Lake Superior region for its abundant rugged, natural beauty, dramatic seasons, and nearby canoe country. We permanently migrated to Duluth about 20 years ago where our paths finally crossed in 2009. Sharing a deep love for the outdoors and photography, Gary promptly began mentoring Dawn in digital photography and in the ways of wilderness canoe tripping. We cannot imagine a more fulfilling lifestyle than being immersed in Nature, learning about the flora and fauna and ecosystems we encounter, and creating meaningful photographs, video footage, and experiences to share with others. Our distinctive fine art nature photography reflects our shared love, reverence, and appreciation of the natural world. Our portfolio covers the spectrum, ranging from images of tiny critters on the forest floor, to intimate and grand landscapes, and everything in between, during all seasons, all weather, day and night. We prefer to "rough it" -- paddling and hiking, primitive camping, out in the elements day and night (among some pretty pesky insects, mind you! ), away from the hustle and bustle of modern society, often without cellphone signals, where we are immersed in the wilderness experience, flowing with the rhythms of nature, deeply mindful and connected, filled with gratitude. Each of our hikes and canoe trips presents unexpected photographic delights that educate us, provoke wonderment, and strengthen our innate connection with the land. Our photographs, videos, and writings convey that mindset along with the essence of our experiences in Nature. In 2014, Gary completed a 221-day solo canoe trip throughout the Boundary Waters Canoe Area Wilderness (BWCAW) and Quetico Provincial Park, documented through 40,000 photographs, video and audio recordings, and journaling. The grand adventure marked the 10th anniversary of a near-fatal brain aneurysm (AVM). During that health crisis, the lure of the wilderness fueled Gary's determination to heal throughout his 3 months of arduous therapies and recovery. He refers to his canoeing adventure as "Inspired by Wilderness", and was nominated for Canoe & Kayak Magazine’s 2015 Spirit of Adventure Award for his inspirational journey. Dawn’s “Lake Superior Ice Stacking” video mesmerized millions around the globe as it quickly went viral early in 2016. The Weather Channel stated, "It's the video we can't stop watching." Our award-winning fine art nature photography, videography, and writings can be seen in the Smithsonian National Museum of Natural History, various magazines (including "Nature's Best Photography", “The Boundary Waters Journal”, "Canoe & Kayak", “Canoeroots”, "Backpacker", “Northern Wilds”, and “Lake Superior Magazine”), documentaries by The Smithsonian Channel and The Weather Channel, and regional art shows and exhibits. We hope that the special recognition of our videos and photographs inspires and encourages viewers to enjoy the outdoors in all seasons and appreciate and protect valuable wild places. We also license photographs and video footage and write articles; welcome special projects for individuals, corporations, and institutions (print and digital); offer tailored guide services and public presentations. Please contact us for more information. Thank you for visiting, and please explore our online gallery often to see photographs from our most recent adventures with Nature. For updates and special offers, "Like" Radiant Spirit Gallery's Facebook page.